Executive Chef Jabari Wadlington offers locally-inspired, new-Southern cuisine at Farm Bell Kitchen. Blending traditional ingredients with modern culinary techniques, Chef Jabari incorporates rich flavors, and embraces the farm-to-fork movement by partnering with local purveyors. Farm Bell offers exceptional service in three intimate dining rooms at the historic Dinsmore Boutique Inn. Granite dining terraces and covered porches hearken back to a simpler time. 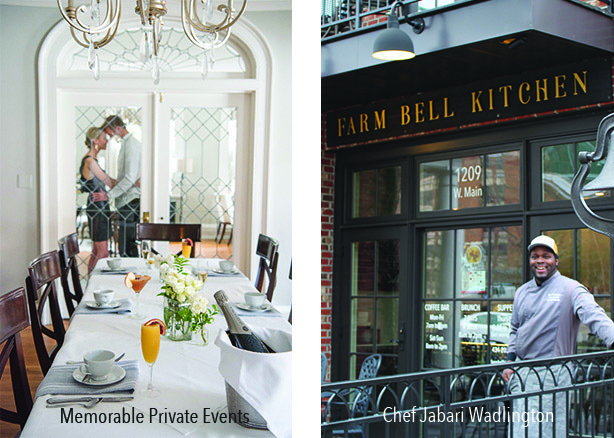 Combining midtown convenience, old Virginia charm, and a dedication to exceptional cuisine, Farm Bell Kitchen provides a memorable and elevated dining experience. If you’d like to learn more about upcoming events, special menus, and be included in special offers from Farm Bell Kitchen, please sign-up for our email communications. We will never distribute your contact information. Send us an email to join our list!